White Lake is located in the Shuswap in the interior of beautiful British Columbia. There is certainly no shortage of things to do in the area, many of them are just a short drive from White Lake Cabins. From hiking and mountain biking to golf and wine tours you'll never be bored. If you can tear your children away from our private beach, paddle boards and kayaks, there are many family friendly activities near by including waterslides, animal reserves, petting zoos, bike parks and more. We've listed some of our favourites below and would be happy to make additional recommendations for our guests. There are several hikes in the area, but one of the closets and a personal favourite leads to spectacular views over White Lake and the Reinecker Creek valley. A short, steep trail to a lookout with wonderful views of White Lake, Little White Lake, and the Tappen Valley and towards Mt Ida in Salmon Arm. Please inquire with us for other trails and hikes nearby for hiking and mountain biking. We would be happy to recommend based on your preferred level. You can visit many tasting rooms at local wineries while you stay here. There are a few local wine tour companies in the area that we can recommend, the closest winery is Sunnybrae at 15 minutes away, 10 minutes from there you can go have a tasting at Recline Ridge. Heading towards Salmon Arm, you can also visit the tasting rooms of Ovino winery and Larch hills winery. This unique group of British Columbia wineries is located in one of the most northern grape growing areas in North America. Each vineyard has its own individual micro climate which gives special character to the wines produced there. A large variety of wines can be found in the region from crisp aromatic whites to big, full bodied reds. The varieties of grapes grown here include Ortega, Siegerrebe, Madeleine Angevine, Gewurztraminer, Pinot Gris, Pinot Noir and Marachel Foch. Shuswap Lake Estates Golf and Country Club is 15 min away. The recently expanded 18 hole professionally designed championship course offers well bunkered, undulating greens, and generous fairways. This scenic course, Par 71, 6467 yards with three sets of tee boxes, provides a variety of challenges for both the accomplished and casual golfer. Talking Rock Golf Course is 30 min away and perfect for all levels. Talking Rock Golf Course has been the pride of the Little Shuswap Indian Band since opening in August 2007. On the shores of Little Shuswap Lake, a unique golfing experience awaits. Designed by acclaimed Canadian architects Graham Cooke and Wayne Carlton, the course meanders through a mature, sandy forest before ending with a breathtaking 18th hole extending along the Little Shuswap Lake shoreline. Talking Rock Golf Course offers a wonderful challenge for everyone and stunning scenery with every shot. There are many farmers markets all around the Shuswap all summer long. They are usually on Saturdays from 9-3pm. Salmon Arm has a farmers market that runs mid week. Dates vary year to year. White Lake Playground is set to start construction for Spring 2018. it will be located 5 minutes away from the cabins. Next to where the park will be built is a bike skills park with graded green, blue and black for difficulty levels. It was designed by the renowned Mountain Bike guru Jay Hoots and built with help by local volunteers. Progressive drops, table tops, balance features and free trail rides are featured in this region's first bike skills park. The park also includes washrooms and a viewing platform. 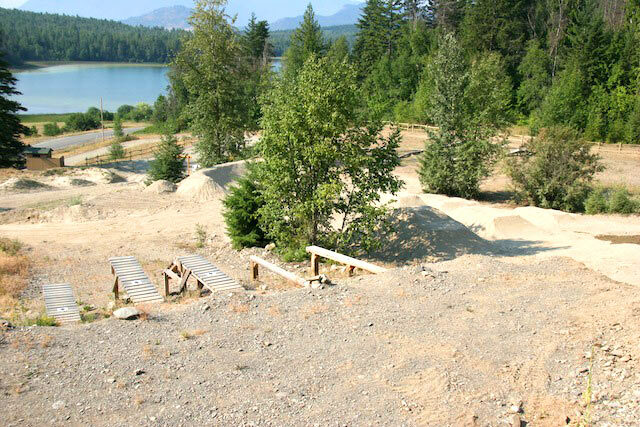 John Evdokimoff Bike Skills Park also acts as a trailhead for the White Lake Balmoral connector recreational trail linking the two communities of White Lake and Blind Bay. Salmon Arm Waterslides contains 7 water slides, 2 hot tubs, a toddler pool and fountain. There is a concession but you are also welcome to bring your own food and beverages into the park as it also offers spacious lawns, tables and lounge chairs. Open end of June and closing first week of September. 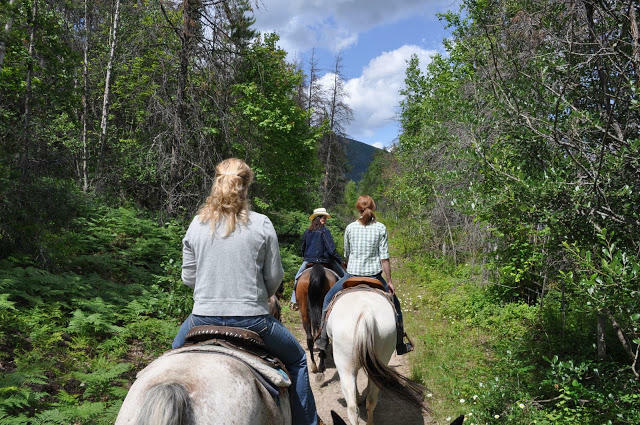 Guided horseback riding tours by High Country Trail Rides are located in Salmon Arm, 20 min away. Located just before Kamloops approximately 45 minute drive. This is an interactive wildlife park that has many animals that are found in the region and has a $2 train ride. More info on tickets and hours. Demilles Market located in Salmon Arm has fresh local produce and animals for kids to pet and feed while you shop for food, they are open all year round. They also have an artisan market located right in the parking lot that is only open during the summer months.